There are a lot of options for the budding army commander in the Android Market. The problem is that most of the options are of the tower defence variety, but there are a few genuine RTS games available. Indeed, there are even several entrants in the Art of War series up for purchase at the moment, but here we have what I feel is one of the most unique offerings of the franchise yet, Art of War 2 Online. Essentially an extension of the single player Art of War 2, this online instalment is a great time waster, particularly as it is a free app. The first thing you are presented with when booting the game up is the server status, which shows you how many players are online, how many battles have been fought, and the total player count, which is at an impressive 44,772 at the time of writing. No worries about finding someone to play then. The game is obviously online focused, but it isn’t exclusively online, as you can play plenty of practice battles against the CPU to fine tune your skills before taking on the world. 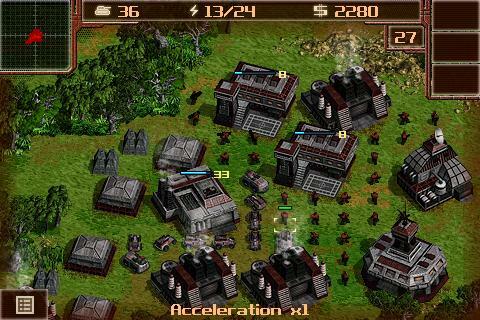 The game itself is an RTS in the classic mould, looking a lot like the original Command and Conquer did in its appearance on the PlayStation One. Art of War differs in that it is turn based, so you get a short time to order your troops where to go, build units etc and when the time is up, all the actions take place and then you are powerless while your opponent has his turn. This gives the game a strategic edge, meaning there is a lot more thinking involved than simply quickly building up a huge army and sending it off. The 50 unit limit is also helpful here. There is no collecting or mining resources, as your generators create cash for you, and all this serves to make the game streamlined, yet highly strategic. When the battles go well, it is an extremely enjoyable experience. The main control interface is a bit of a let down, and feels awkward to use, especially when you are up against the clock. The way you drag the screen to scroll doesn’t work very well, especially when you are ordering troops around. You have to rely on the map, which does work but it is not ideal. The graphics are very much old school and can best be described as functional. The game does always run smoothly, however and I never found any real performance problems. The game offers in app purchases of credits to spend on upgrades, which do give an advantage to players who have splashed the cash but to be honest, the credits are reasonably priced, and it is perfectly possible to beat someone who has a load of upgrades when you have none. These credits can also be won by the best players for free, which is a nice touch. The online options here are immense, from one on one quick matches to big tournaments. There are a whole bunch of online chatrooms for players of all levels, you can make online friends, and even create clans and try to top the leaderboards and hall of fame. There are plenty of maps to play on, with more being added all the time, so if you do spend a bit of money in the games’ shop you at least know the title is going to continue to be supported and expanded as time goes by. Any credits you buy can be spent in any of the developers online enabled games. Overall, this is a fast paced, clever RTS that has a great suite of online features. The controls may be a little difficult, with average looks and poor sound options, but there is a lot to like here if you want some online strategic action.